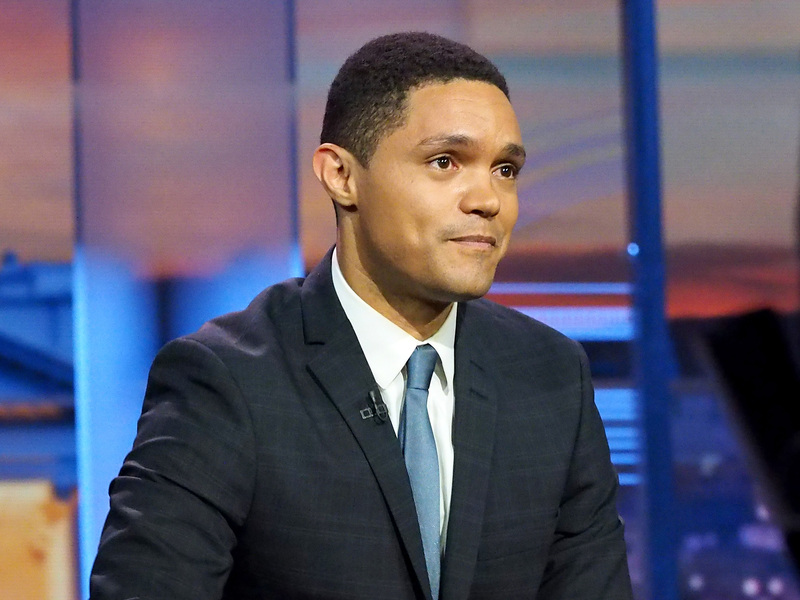 The 2016 presidnetial election wouldn't be the same without late-night TV covering it, including Comedy Central's The Daily Show and host Trevor Noah. In case you were too busy watching a news network, fretting over social media, or just freaking out in general over this nail-biter of an election, here is a transcript of Trevor Noah's Daily Show live election special opening monologue. I'm sure you want to keep updated on what Noah is feeling at this very moment during such an important moment in history and he is pretty much as scared as most other celebrities are. "Welcome to The Daily Show, we are live across many channels. Thank you so much for tuning in. It is election night 11 p.m. on the east coast, 8 out west, and 9 a.m. tomorrow in the middle of the Pacific Ocean, which is where we may soon want to live. This is it, the end of the presidential race and feels like the end of the world. It's, i'm not gonna lie, I don't know if you've come to the right place for jokes tonight. This is the first time throughout this entire race where I am officially sh*tting my pants. I genuinely do not understand how America can be this disorganized or this hateful. I don't know which one it is, when most democracies in the world pick a leader, they go by who do more people vote for and America just makes it interesting by being like, 'Oh, no, let's just do this electoral college thing,' you know? Tonight is all about which candidates, Hillary Clinton or Donald Trump, can win majorities in enough states to get 270 electoral votes and thereby claim the Iron Throne. Right now, honestly, I would call it a nail biter, if I had any nails left. Donald Trump is doing much better than expected. He's doing so much wining that I'm tried of winning. I cannot believe I finally get what that means. he warned us about it. I mean, right now, I don't know if you've seen this, the Mexican peso is crashing, that's what's happening to Mexico's currency, which means if Donald Trump wins, Mexico can't afford to pay for that wall. This is one of the craziest nights of my life. We still don't know what's happening and we're gonna take you through it. Every result that comes in we will share with you and it's so crazy because the day started out so peacefully. You know, Hillary and Donald went to vote earlier today and Trump went to vote with his wife, Milania. And this is true, when they started filling out their ballots, it looked like he was checking to see who Milania was voting for. And it wasn't just Donald Trump either, even his son Eric Trump was checking his wife's ballot. It tells you something that the Trump men themselves weren't sure who the Trump women were for voting for. It was like leaning over going, 'Hey, you're not gonna screw us over?' And it's like, 'Oh, no, no. We'll do what do you to do women.' 'Ok, good. Ok, good. Ok, good.' It was a lot easier for Hillary. She went to vote this morning. I know this is a scary moment and it's too close to call, but can we just acknowledge what an amazing moment this is for Hillary Clinton and all women? Can we just acknowledge the moment that we may be witnessing? To see her name on the ballot, possibly the first woman president. Although, to be honest, when I watched that [a clip of Clinton saying she is humbled] I called a little bit of B.S. You know, when she was like, 'I'm humbled, I'm humbled.' That's not humbling to see your name as president. That's the opposite of humbling. That's like when people win an Oscar and, 'I'm humbled.' No you're not, you won an award. That's not humbling. The people sitting down are humbled. That's who's humbled. Now Hillary is like, 'No, no I'm really humbled now. Where's Trump? Yeah, I'm very much humbled if half of Americans prefer the racist sunset to me.' Then maybe, you know? Maybe she just wanted to use humble because that's a word Turmp didn't know? I don't know what she was doing there. Maybe he was there doing, 'I've heard rumors Hillary was humbled, folks. I don't know what it means but it sounds bad. I don't know what that means.' So, look, we are going to make jokes tonight, but I can't front, but I am very much afraid." There you have it, Noah is just as scared as you probably are.